The tree. 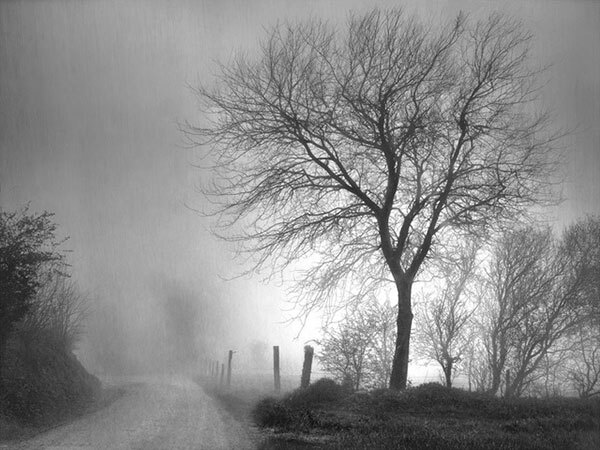 A bare tree in fog. A bare tree in snow. A bare tree in stormy clouds. A tree is a sublime sculpture, as shrouded in fog or highlighted by white snow, it reveals its inner soul. Some trees are stately, some are graceful and some are a bit raggedy. As a photographer, to me they are all beautiful. Each one is unique much like we are. Each one has a particular inner beauty to reveal much like we do. As an artist with a camera, I have intuitively and sometimes unconsciously sought out these beautiful, naked sylvan structures. I prefer to photograph them in weather conditions that isolate them and reduce them to their bare bones. They reveal their complexity yet their simplicity. Nothing is hidden. Old broken limbs as well as tender new shoots are revealed. We see their gnarlywarts and their beautifully textured bark. Come spring, we can no longer see theirgraceful limbs, their inner souls, as they become all dressed in green. Theirnew clothes hide who they really are, what their lives are like within. We mustwait until the next fall and winter to see those beautiful sylvan sculpturesagain – to see ourselves in them again.